This is the main focus of the challenge…paying close attention to what your mind is telling you is possible (or not possible). As you work on recognizing & stopping the old programs you have running through your mind, you can begin to replace them with ANYTHING YOU WANT. There is NO LIMIT when it comes to your mind & all creation begins as a thought. Also, pay attention to what you are “feeding” your mind. Your thoughts are very easily influenced by the people you interact with, by the entertainment you watch, & by the things you read. Get in the habit of asking yourself: Does _______ inspire me to be my best self? During this challenge, pay close attention to your thoughts about your body. If they are negative, turn them around & say something positive. Tell yourself that, for the next 30 days, you are going to truly appreciate the body that God has given you. Take a walk, drink more water, go to bed early & get up early so you have some time to yourself. The better care you take of your body, the better you’ll feel about yourself. Thanks Melanie! Those are some of my favorite quotes!! They are so good to read when I need a reminder that I can only do so much by myself. Love the quotes! Like a 3 legged stool, you need all three to be balanced. Thank you for taking a stand for Christ!! As a Christian, I know that I don’t always put Christ first and let His light shine from within me. I am so grateful that you have posted this!! By the way, my wrist is in some pain!! I love the challenge from yesterday. Please pray for a very dear friend, she lost a family member. Thanks in advance for the prayers. Looking forward to the next 28 days!!!! Thanks for your comment Michelle…I couldn’t do these challenges without reminding myself & others where the true source of power & happiness comes from. If we can keep Christ at the center of everything we do, we cannot fail….without Him, we will. It’s so simple, but life can be so distracting that it’s easy to forget. I’ll keep your friend in my prayers. 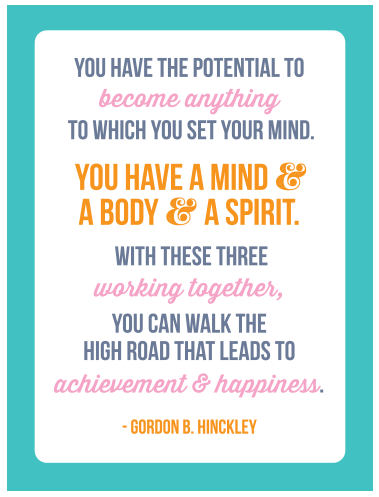 Love the reminder of these 3 important pieces of each one of us. Love the quotes, they are based on love, positive thoughts and grow. They bring me joy and enthusiasm for the possibilities! I think it’s so great that you & your husband are doing this together! Let me know how it goes! This is just what I needed today, thanks! Thanks Marne! That’s why I do these challenges. 🙂 I’m so glad you’re joining in! This is my first time doing this! I have been in the hospital for 9 days now and have just gone to a physical rehab center to regain strength. Little did I know that God was going to do some other strength ink along the way. Any suggestions about journaling and pictures so not to forget what he has done? I am limited with some resources but I do have a camera and notebook. I am definitely in from today ! This could not have come at a better time. I am changing my negative thoughts and eating habits from now. How do I get the 30 day challenge on thoughts??? I really want to read! !